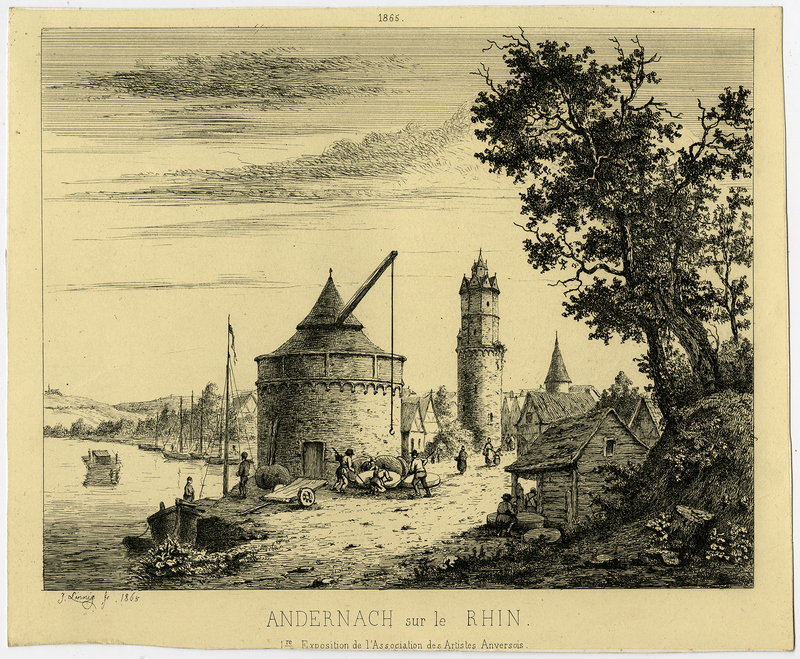 Subject: Antique Master Print, titled: 'Andernach sur le Rhin.' - A view of the German city Andernach on the Rhine. This view includes the medieval Round Tower (Runde Turm), as well as the Old Crane (Alte Krahne). Condition: Very good, given age. Margins trimmed somewhat irregular, just over the platemark. Remains of attachment to carrier verso. General age-related toning and/or occasional minor defects from handling. Please study scan carefully. Size (in cm): The overall size is ca. 22 x 18.1 cm. The image size is ca. 22 x 18.1 cm. Size (in inch): The overall size is ca. 8.7 x 7.1 inch. The image size is ca. 8.7 x 7.1 inch. Description: Source unspecified, to be determined. State: Fourth state of 4. Ref: Hippert & Linnig 45. Artists and Engravers: Made by 'Jean-Theodore-Joseph Linnig ' after own design. Jean-Theodore-Joseph Linnig (1815-1891) was part of the artistsfamily Linnig. He had one the best collections of contemporary graphic art from Belgium and the Netherlands. His collection formed the basis for the descriptive catalogue written by him with Hippert.